A mother of 3, Soury works from home running 2 online business (www.kawaiigoodies.com and www.whimsicalgiftsetc.com). Her favorite mediums to work with are fabric, paper and "anything sticky"! Her shop offers both hand made and commercial craft supplies such as hand stamped muslin ribbons, fabric tape and labels, imported Japanese stamps, and washi masking tape. Soury's stuff is affordable, adorable, and will inspire you to create something wonderful! On Kawaii Goodies facebook page Soury has a giveaway EVERY Monday, so don't miss out on "liking" her page so you can more chances of winning! You need to go look at Urban Walls Etsy shop and then comment in the comment section of this post which of their Vinyls you love the best. Love the Japanese Inspired peel and stick Fancy thank you stickers. I already follow you on FB now I am following Kawaii! I love this give-away! 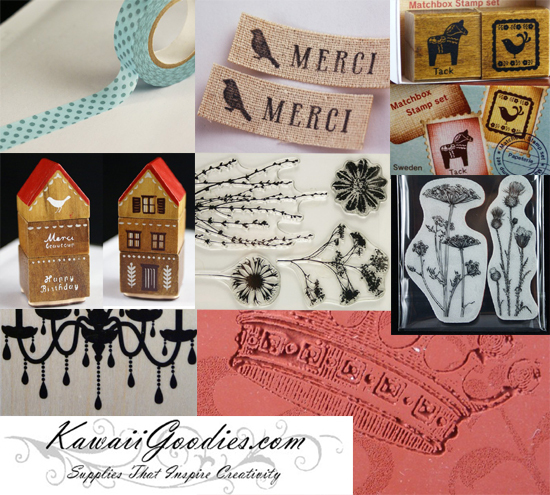 Kawaiigoods has beautiful products - one of which is the Metallic silver ornate lace photo fame trim washi. It's a stunning wash paper. Now a BettyBake FB fan! Yay! Now a kawaii-goods FB fan! Yay! I just love any of the masking tapes! Especially the red geometric stars. I also liked Kawaii Goodies on FB. & I liked Betty Bake on FB. am finally a follower of you Blog-woohoo! and absolutely LOVE the Peel and Stick range from Kawaii Goodies, the stickers, the lace tape- absolutely beautiful and awesome! Also the Japanese rubber stamps of all sizes are superb! so much to like but the peel and stick tape is fantastic!! Love the lace peel & stick and how can you resist those gorgeous cutters? Oh, and I like you on FB too! Sorry, here is my separate comment for 'I like you on FB too'. I liked you page on Facebook. i liked Kawaii Goodies on Facebook. I absolutely LOVE the Peel and Stick range from Kawaii Goodies, the stickers, the lace tape and other decoative tape- absolutely beautiful and awesome! I found Kawaii Goodies on Etsy a few months ago when looking for lovely hand-stamped muslin ribbon, and the drooling & awe began! I love the wedding initials hand-stamped muslin. We are hoping to have a "Very Etsy Homemade Wedding" Sept. 2011 & buy only from Etsy for this & gifts now, including Christmas, to support this website that I have dreamed of. The ribbon tapes are also soo lovely. I would love to craft with them making shadow box dioramas. I have subscribed and liked kawaii :) I have to say that http://www.etsy.com/listing/71815423/set-of-25-eiffel-tower-hand-stamped-semi as well as all of the other hand stamped bags are so cute:)! I love how much detail has gone into them!